A Jaquarundi...an endangered wildcat similar to the ocelot. Native to Belize, the Jaquarundi is nicknamed the "water cat". 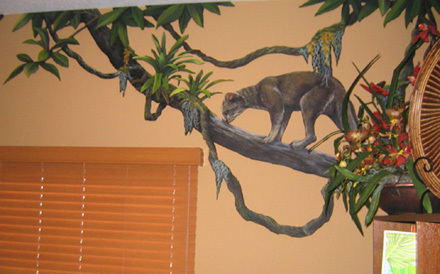 This trompe l'oeil wood cut out mural is approximately 8 feet by 4 1/2 feet, a wood cut out mural of this nature... size and detail would run anywhere from $600.00 to $1,200.00.